THAT TINY OLD Cascade Mountain mining town of Cle Elum was the site of what was surely a memorable evening of entertainment on Saturday June 28, 1947. It was there, at the local Eagles Temple (220 Pennsylvania Avenue), that the homegrown Peggy Miner's Band provided music for public dancing at an event sponsored by a local equestrian organization -- the Cle Elum Riding Club. But for the basic admission price of $1 (for men) and 50¢ (for "Extra Ladies"), attendees would also thrill to a bonus "Special Attraction." 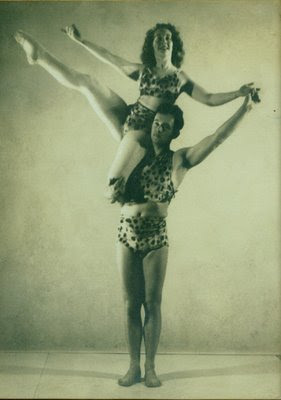 Brought over "Direct from Vogue Studios, Seattle" (315 Marion Street) were the dynamic dancing duo of Jack & Paula. 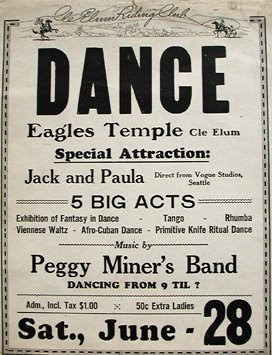 As advertised, Jack & Paula were booked to perform "5 Big Acts" that night -- such daring and exotic presentations as an: "Exhibition of Fantasy In Dance," a "Tango, a "Rhumba," an "Afro-Cuban Dance," & even the spine-tingling & no doubt, death-defying, "Primitive Knife Ritual Dance." In hindsight though, the greatest spectacle for witnesses that particular summer night must have been Jack & Paula's version of the stately and dignified "Viennese Waltz" -- as rendered in their matching Me- Tarzan-You-Jane leopard loincloth and bikini stage apparel.